Everyone that has run Little Giant power hammers or the other derivations designed by the Meyer Bros such as the Murry and Moloch knows they can be very quirky. When out of adjustment, worn or run too fast they go into a spasmotic cycle popularly known as the "Little Giant Hula". The ram goes up when its supposed to go down and down when its supposed to go up! Every part moving to extreames but not doing any work. The "hula" is the worse case but almost every Little Giant suffers from the "Blues" at some point. There have been many explanations in the past but Dave Manzer is the first to have studied the problem seriously. Dave has taking a scientific approach to the problem using strobe lights and high speed photography. He is the first to correctly explain in detail the dynamics of the Little Giant and why things go wrong. This video explains his methods, conclusions and solutions to the problems. He shows how you can tune up your Little Giant so that it performs better than from the factory and at least as well as any other mechanical hammer. Among other things he points out that as-built, Little Giants have design flaws that are easy to correct. He also points out examples of construction flaws that lead to erratic operation. Dave also points out that many Little Giants are setup to run too fast. I've been telling folks this for years. Dave explains how to tell if its running too fast and what to do about it. This 60 minute, professionally produced instructional video analyzes mechanical powerhammer action. It clarifies the exact action of a hammer tuned to the "sweet spot" where all components work together to create the most efficient blow. It takes you step by step through the process of a revolution of a powerhammer at speed through the use of scale diagrams and slow motion digital video, and clears up many misconceptions on Little Giant style powerhammer springing and adjustment. Examples of the versatility of a well-tuned 100# hammer for doing delicate work. These hammers rival the versatility of many air hammers. How to address common wear problems and how they affect timing and performance. Spring rate and how it effects ram action. Proper working adjustments and how to perform them. Examples of forging hollow materials. Leaf veining and chisel work. Many other tips on rebuilding and modifications. I recently ordered the video for Little Giant power hammers. I found it to be most helpful, and Dave Manzer also clarified some questions by email. In just a few days the 100# Little Giant was tuned and delivering more performance than I thought possible. I would recommend this video to any Power Hammer owner. I have to tell you I thouroughly enjoyed your tape. It is extremely well done. You can draw much better than I can. 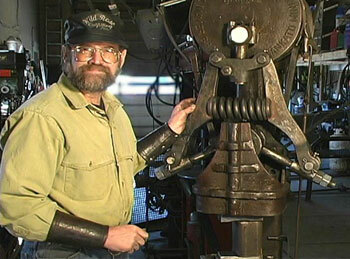 I tried to explain a lot of that on my power hammer video tapes but not as thorough, or as clear as you have made it. I also like your broken pull-rod for the brake. I just sold 2 people a set (my) of power hammer tapes because of your tape. Guru and Friends . . I ordered Dave Manzer's video tape on power hammers. I have watched it about 6 times and each time I learn a little more about these sometimes dysfunctional hammers. I have had a fear of the unknown as far as taking the hammer apart or making adjustments. Well long story short..I disassembled my 25# LG Friday..changed the clutch material (someone had used a rubber conveyor belt) and replaced with 1/4" leather..minor adjustments to the linkage arms...Shazam!!! Amazing how much control from light taps to heavy hits. Daves video is great..I recommend it to anyone who has a mechanical hammer that dosent run correctly...and thanks guru and anvilfire for making me aware. Junk Yard Hammer (JYH) Builders: If you are designing your own hammer or using someone elses plans such as a Tire Hammer with the Dupont linkage (toggle arms and coil spring) this video is a MUST HAVE. Dave explains the dynamics of this mechanism accurately and like no-one else before or since. Dave goes through the adjustments and why you need them, shows proper and improper functioning of the hammer. This knowledge is even more important to builders than to operators. NOW Available exclusively from anvilfire!